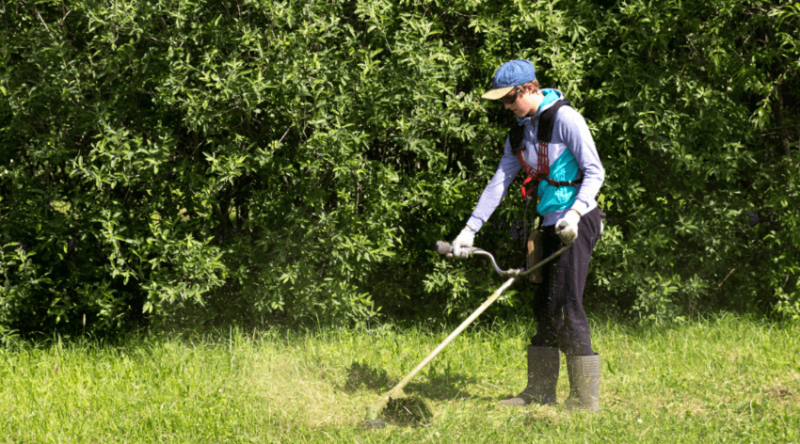 Whether you call it a weed eater, weed trimmer, grass trimmer, or weed wacker, it’s all the same thing – but not all of them are created equally. One of the best weed eaters you can buy is a Stihl. Over the years, Stihl has made a name for itself in lawn care. Their powerful tools are high quality, easy to use, and they last for years – even a lifetime if you maintain it well. 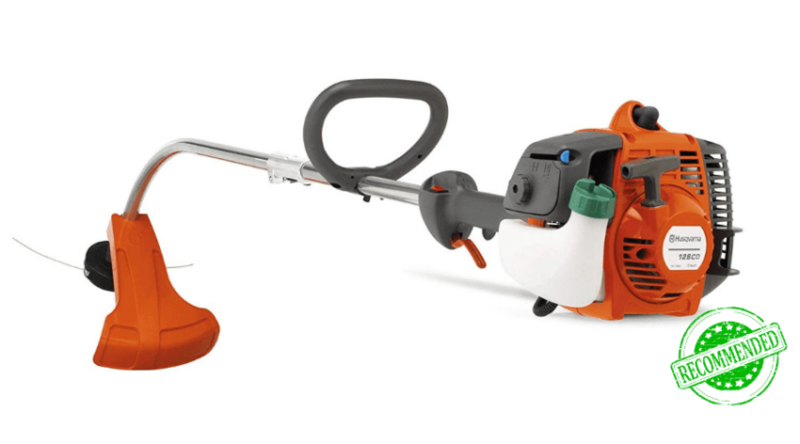 The only question you should be asking is: What’s the best Stihl weed eater? The answer to that question isn’t so easy, though. Are you looking for the best Stihl weed eater for the money? Or simply the best trimmer for home use? Perhaps you need a powerful weed chewer for clearing trails. Let’s look at how to choose the one that’s best for you, and then read through our Stihl weed eater reviews. WHO NEEDS A WEED EATER? If you’re a homeowner with a bit of land, and you’re not great with a scythe, you’re likely in the market for a good weed wacker. The first thing you should know here is that you don’t need a professional grade weed eater, unless you’re planning to do landscaping as a side job. 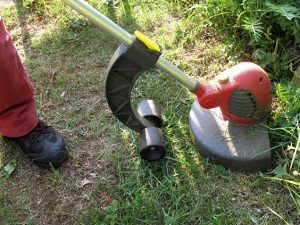 A weed trimmer is great for manicuring your lawn just so to make the edges look great, and to get the stragglers that a lawn mower may leave behind. It’s also virtually the only way you’re going to be able to trim around trees, in gardens, and along fences. Bottom line: If you own a piece of land (or even if you’re leasing, and you’re expected to do lawn upkeep), you likely need a weed eater. Picking the right grass trimmer starts with deciding a few things, such as the power you require, the size of your yard, and how tall you are (seriously). A straight shaft is the most preferred type of weed eater because it offers a longer reach, allowing you to get to the weeds or grass without having to get right up on them. They can also be easier to maneuver under bushes. These are also easier to handle if you’re taller or have a bigger build. Curved shaft weed eaters are lighter in weight and easier to manage if you’re a slight person. You don’t lose any power by choosing a curved shaft, though. Generally, you should choose a curved shaft if you don’t have a ton of trimming to do, and you don’t have underbrush to worry about. Ask your neighbors which weed eater you should buy, and they’re likely going to suggest an electric model – especially if you prefer to do yard work at 6 a.m. on a Saturday morning. 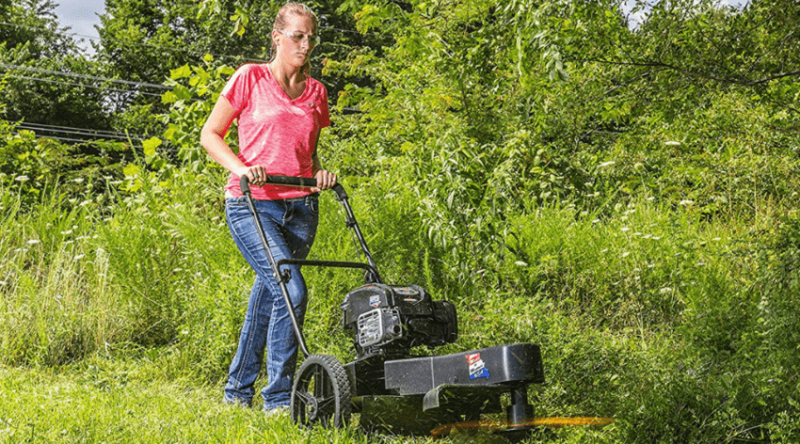 The electric models and battery-powered trimmers are a bit quieter than a gas-powered one, and your neighbor wants to sleep in!There are some excellent reasons to choose a gas-powered one, though, including the life of the weed eater and the power you get from a gas string trimmer. It’s a good idea for you to get a lesson online or from someone who knows how to start a Stihl weed eater because it can be tricky the first few times. Stihl weed eater maintenance is easy, whether you choose gas, electric, or battery-powered, but the gas trimmer is going to require that you add fuel before you use it every time. An electric one you just plug in, and the battery-powered trimmer only requires that you charge its battery before you use it. Bottom line: If you have a large yard to maintain, a gas-powered trimmer is your best bet. For smaller lawns, an electric version will work well (and not disturb your neighbors). A battery-powered weed wacker is great for those jobs that are far off at the edge of your property where a line won’t reach. Obviously, a lawn mower can’t reach the places a trimmer can, which is why you need the extra help. Another thing to keep in mind is that split-shaft trimmers aren’t the best choice. 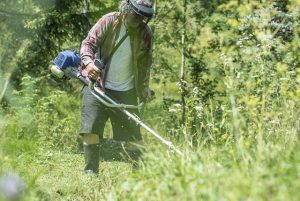 Although it’s tempting to pick up a weed wacker that takes attachments to turn it into a leaf blower or a hedge trimmer, they’re not nearly as effective as just buying the right tool for the job. All of this can be done with a trimmer, but not a lawn mower. Theoretically, you could clear tall grass with a mower, but chances are the tall grass will just jam the machine. The trick to doing all of these things with a weed wacker is knowing which technique works for each job. For example, the clearing of tall grass works well if you use a sweeping motion, as if you’re using a scythe. Regardless of whether you choose a straight or curved shaft; electric or gas; or buy a high-powered, professional grade trimmer, or one meant for home use, the best Stihl weed wacker is the one that fits your hands, your yard, and your budget. Read through our Stihl weed eater comparison to help you choose the right one for you! When you need a string trimmer to take care of small jobs around your front or back yard, you may not need a powerhouse trimmer. 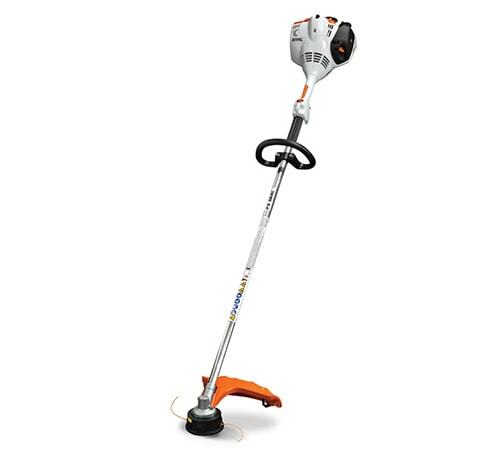 This Stihl model is an entry-level weed eater that handles well, thanks to its curved shaft. It includes some great features to make it easy to use, whether you’re a pro or beginner power tool user. An adjustable front handle makes it easy to make this trimmer comfortable for you to use, regardless of your height. Move it up to give you more reach and not have to bend down to reach the handle. Or slide it down and lock it in place to give shorter users more control over the tool. Stihl also includes an easy starter that typically only takes one pull of the cord after you prime the pump. The stop switch is a great safety feature that makes it easy to stop the motor if you’re, say, weed whacking in the back yard and nearly chop down some of your prized daffodils. Just hit the button and it stops whacking. If you’re concerned about buying a gas-powered trimmer because of emissions, you’ll be happy to know that Stihl works hard to create products that produce low exhaust emissions, making it a cleaner choice for the environment than ever before. It’s one of the easiest to use trimmers on the market, which makes it a great beginner lawn care tool. The best parts are that it’s lightweight and it starts easily, but for more details, be sure to check out this Stihl weed eater specs. 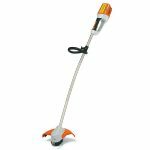 For beginners, this Stihl weed trimmer is a good choice because it’s lightweight and easy to use. 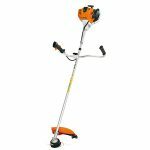 For those who have an acre or more of land to trim, then this Stihl model is a good choice. The straight shaft makes it easy for you to get to those tough-to-reach spots under brush and bushes without damaging the foliage you want to keep. Although this Stihl weed eater has more power, it’s still relatively easy to handle. Despite the straight shaft and increased power compared to other similar models, it’s still a lightweight machine, which is important when you have lots of weeds to power through. The heavier and more powerful a weed trimmer is, the more likely your arms will tire out. The increased power, though, means you can get your yard done more quickly, and the tool can handle jobs like slicing through tiny saplings you want to clear away. 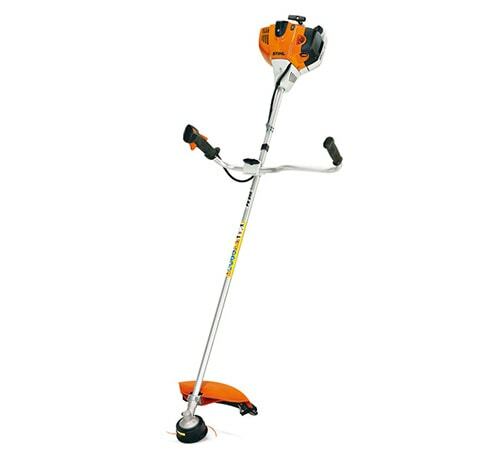 When you need a bit more power and a straight shaft to reach under bushes, this Stihl model could work well for you. Weed wackers are inherently loud – if you buy a gas-powered one, anyway. If you have neighbors complaining about your Saturday morning routine, then you might want to consider an electric trimmer, like this one from Stihl. Not only is it quieter, thanks to the electric-powered motor, it’s also a cleaner choice for the environment – there are zero emissions from an electric motor. The other benefit of buying an electric trimmer is that it’s one of the easiest trimmers to start and stop. There are no cords to pull, no pumps to prime – you just press a button and flip a switch to get it going. Stihl’s adjustable handle – which is present on almost all models – lets you move the handle up or down, and 360 degrees around to make it comfortable for your hands and height. One of the most noticeable difference between this trimmer and a gas-powered one is the weight – it’s nearly two pounds lighter than most gas trimmers. The curved shaft makes it easy to maneuver, especially when you’re doing light jobs around your yards, like edging or whacking the weeds on your driveway. This Stihl electric trimmer is a good choice for small yards in crowded neighborhoods – it’s lightweight, quiet, and easy to start and use. There’s something to be said for cordless power tools – you don’t get tripped up by cords, they’re generally lighter in weight, and they’re better for the environment. 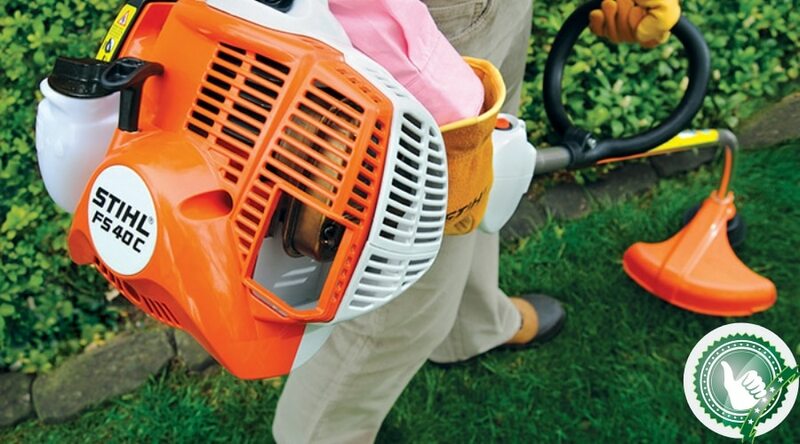 This Stihl battery-powered grass trimmer emits zero exhaust, meaning you won’t choke on harsh smoke. Plus, it doesn’t get much easier to use than this – you just press a few buttons to start the trimmer, so there’s no need to prime a pump or pull a cord over and over, like you would with a gas trimmer. If you live in a suburban area where the houses are close to each other, you know how loud some power tools can be. This Stihl weed eater is quieter than traditional trimmers, so you won’t disturb your fellow suburbanites as much. You can also go to the very edge of your yard without worrying about whether you’ll be able to reach – there are no cords to tug on. One concern with battery-powered tools is a loss of power. However, this battery-powered weed wacker uses a 36-volt Lithium-ion battery, which is a good choice for rechargeable batteries. You won’t lose power as the battery drains – it continues to cut through grass and weeds until the battery dies. So, the performance isn’t affected by diminishing returns. A battery-powered Stihl can still hack it compared to gas- and electric-powered weed eaters, but it’s more convenient overall. Whether you’re a professional landscaper or you simply have a large job to do at home, you may feel like you need a Stihl professional weed wacker. For the most power, you should consider this model, which has a robust engine and a large bike handle to let you harness all that power. 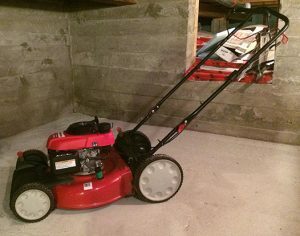 Keep in mind that with a more powerful engine, the trimmer is also going to be bigger and heavier. This is a gas-powered trimmer, so you should expect it be loud (be sure to wear protective ear plugs) and emit lots of exhaust. For the best control, and to reduce fatigue while trimming a large yard, use the harness that Stihl includes – it’ll do wonders for your back and arms because this is a heavier trimmer. 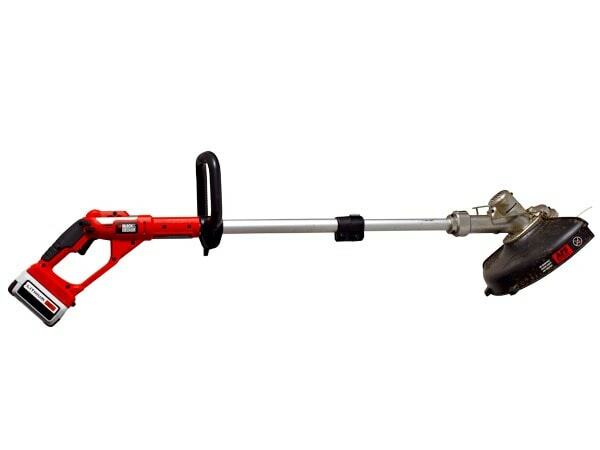 This is one of those trimmers you’d want to tackle woody weeds, such as thistle, or weeds that grow in between small rocks where you definitely cannot take a mower. Like almost every Stihl grass trimmer, this one generally starts on the first pull – that alone may be worth the price to you. The fuel tank holds a little more than 25 ounces, which is more than enough to take care of moderate jobs, but you may find you have to refill it a few times for bigger jobs, but it comes with the territory. 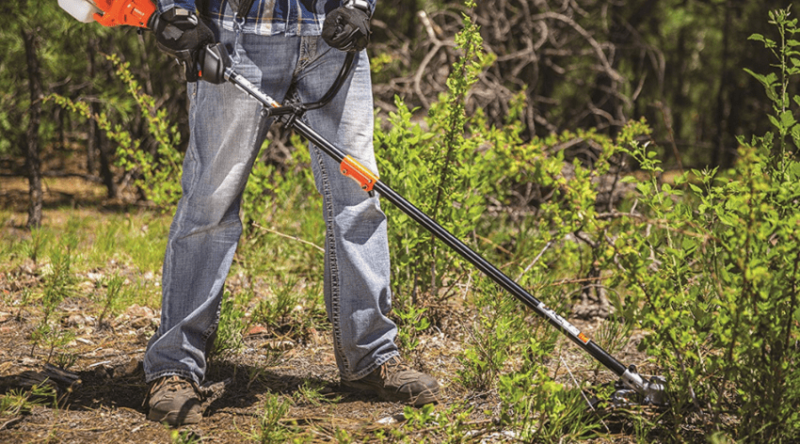 If you have thick brush, tall grass, saplings, or trails to clear, you’re going to want a Stihl with more cutting power, and this one could be the right one for those tough jobs. 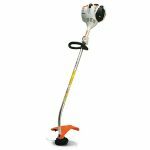 Choosing the best Stihl weed wacker is a difficult task because there seems to be one for every type of job out there. 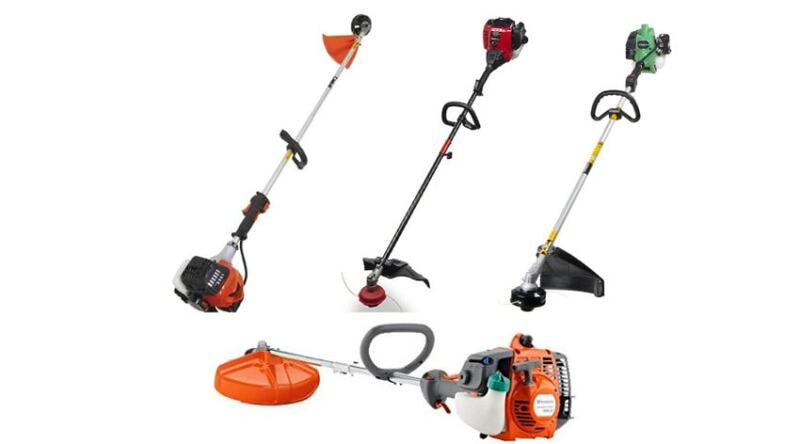 Although you may find a battery-powered or electric-powered grass trimmer a better choice for you because of noise ordinances or you’re concerned about storing fuel, then by all means, choose a Stihl that suits your specific needs. However, there is one weed wacker here that’s a good choice for almost anyone who needs to care for a lawn or back yard. 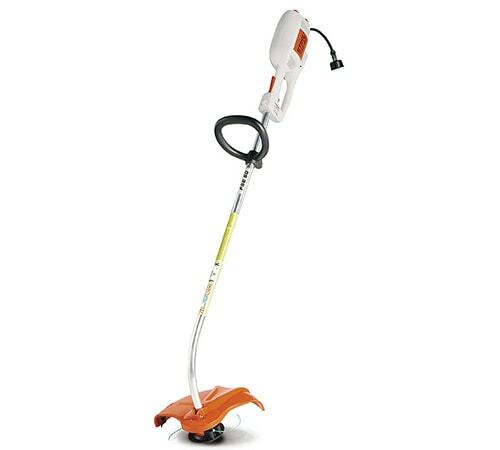 Overall, the ideal weed wacker for almost any homeowner is the Stihl Grass Trimmer FS 56 RC-E. The moderately-priced gas trimmer has a low-emission engine, so you aren’t clogging the environment with big, black plumes of smoke, and it has enough power to tackle big jobs. The gas engine means you don’t have to worry about tripping over cords. The straight shaft makes it easy to use under bushes, and the handle can be adjusted to make it comfortable for anyone to use. However, for the price, we definitely prefer other gas trimmers that are comparable to the Stihl model. Take the Husqvarna straight shaft 4-stroke, for example. It offers pretty much all the same features for the same price, but is also a trusted brand and more readily available to consumers.